Choose from more than 1,400 courses (SCORM 1.2 compliant). License content for use on your LMS. Deliver, manage and track learning from anywhere. The new LMS interface provides accessibility from tablets and smartphones. Engage employees with video-rich compelling content. Choose from more than 1400 SCORM 1.2 compliant courses in safety, maintenance and human resources. The award-winning DuPont™ eLearning Suite is a comprehensive online training platform that uses interactive learning technologies to help you manage your employee training from start to finish. With a library of more than 1,400 courses, we can provide in-depth safety, maintenance and human resources training to help your employees work safer, smarter and more competitively. The DuPont™ eLearning Suite includes scalable applications with versatile implementation options. As a Fortune 100 company, we bring our customers stability, resources and innovation leading to sustainable solutions and long-term relationships. Content is designed to engage employees, facilitate learning and improve performance through interactive, rich-media delivery and user-enabled customization. More than 1400 SCORM 1.2 compliant titles covering the latest issues in safety, human resources, and maintenance and reliability. For the past 30 years, more than 190,000 people in 129 countries have turned to DuPont Sustainable Solutions for innovative employee training programs. We are a Fortune 100 company providing online training solutions and customizable e-learning courses tailored to your organization's unique needs. We bring stability, resources and innovation to our customers, all backed by DuPont's 200 years of operational excellence. The DuPont™ eLearning Suite is a comprehensive online training system that helps you manage your employee training from start to finish, simplifying and streamlining the process. More than 1,400 training titles are available in 20+ languages, including online safety and compliance training. 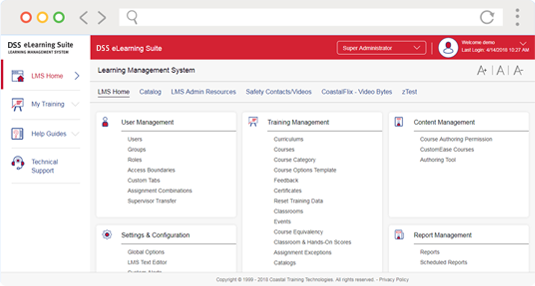 Suite components include the Learning Management System (LMS), Interactive Courseware, and Authoring Tool. The DuPont™ Learning Management System enables organizations to deliver, manage and track engaging e-learning experiences. With the LMS, it has never been easier to assign, administer and document the results of your employee training, and it can be done from virtually any location around the world. Our Interactive Courseware, or e-learning courses, cover four key content areas: safety and environmental, human resources, maintenance and reliability, and healthcare. The courses incorporate sound instructional design based on the ADDIE (Analysis - Design - Development - Implementation - Evaluation) model to help ensure that the learning objectives of your organization are reached. When you need to deliver custom training specific to your organization, the Authoring Tool allows you to create interactive, dynamic online courses with no programming skills required. The DuPont™ eLearning Suite encompasses a variety of tools to help ensure a successful training initiative and gives your employees on-demand access to online training from anywhere with Internet access. To learn more, or to preview individual components or courses online, arrange a free, no-obligation demonstration today!